Protection – Protecting your employees, as well as your patients, is essential. 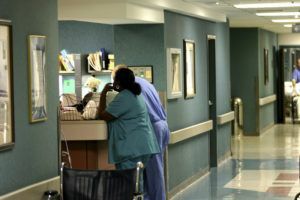 In healthcare, staff is at a higher risk for experiencing violence, with eight to 38 percent of health workers being the victim of physical violence during their career, according to the World Health Organization. With RTLS, staff members can call for help at any time. All nurses, doctors and other employees have to do is activate the wireless call functionality of the Staff Duress badge, which lets them call for help in a way that doesn’t draw attention. The Clinical-Grade Locating™ feature also provides certainty-based accuracy, which helps security accurately locate staff members fast. Nurses can also be assured that their response time, as well as time spent with patients, is properly documented in the case of liability or complaints. Efficiency – Hospitals can become chaotic, leaving staff overwhelmed. RTLS lessens the rush by creating a more efficient workflow. Accurate location information combined with existing technologies allows for enhanced communication capabilities for clinical staff members. As a result, employees can provide faster response times to patients and deliver a better patient experience. RTLS also makes your team’s jobs easier with the ability to locate equipment the moment it’s needed, automated nurse call cancellation and dome lighting, proactive staff rounding reminders, and time-stamped staff presence for automatic EHR documentation. By documenting staff rounds and location, manual data entry times are reduced, which lets employees focus on more pressing tasks. Infection Prevention – Stopping the spread of infections is an ongoing challenge for hospitals. RTLS provides real-time tracking of medical equipment, staff and patients, which makes it easier to prevent and control outbreaks. For example, CenTrak’s RTLS can identify which contaminated rooms or units were visited by staff, other patients, and equipment. With that data, you can send out alerts to at-risk parties, sanitize soiled equipment and limit further spread of infection. If applied to assets, RTLS also documents the usage, cleaning and storage cycles of your hospital’s medical equipment, which helps you make sure that all your assets are cleaned and sanitized before returning to work. One of the biggest culprits of transmitting infection is unsanitary hands. Yet, according to the CDC, healthcare workers are cleaning their hands less than half the number of times that they should. CenTrak’s electronic hand hygiene monitoring system recognizes if a healthcare worker washed their hands in accordance to facility protocols (i.e. exit and entry of patient rooms). A missed opportunity to comply with hand hygiene protocols results in a gentle reminder from the RTLS badge to improve compliance and prevent the spread of infection. The collective and ultimate goal is to improve patient care, and when successfully communicated to your staff, using more effective and efficient technology to accomplish that objective becomes more widely accepted. RTLS is used as punitive monitoring tool: Yes, RTLS can provide certainty-based location of staff members. Its intention, however, is to not serve as big brother for the workplace. The goal of CenTrak RTLS is to ensure the safety of staff, provide them with information about their team members, as well as enhance their day-to-day workflow so they can spend less time with manual data entry and more time focusing on patient care. RTLS adds work: For IT departments, the biggest concern in adopting RTLS is it’ll add to their existing workload with another system to manage. While some RTLS may require additional maintenance, CenTrak RTLS integrates with your hospital’s existing technologies to maximize your tech team’s time. In addition, CenTrak’s Connect Pulse™ platform, proactively monitors system health and tag battery life with 30-, 60-, and 90-day low battery alerts. Implementing RTLS requires my facility to shut down rooms and units: All of the CenTrak in-room infrastructure can be installed in minutes. Costly infection control measures are not required and the room does not need to be shut down. RTLS include bulky badges: While some RTLS come with heavy and bulky tags, the CenTrak RTLS is different. Badges for the CenTrak system are lightweight, thin and about the size of a standard hospital badge, which makes them easy to attach to clothing and comfortable to wear. RTLS technology is unsafe: Ensuring your healthcare network’s technology is safe is a valid concern. The average power a standard cell phone emits is 1 million times greater than what CenTrak emits from any of its devices. The CenTrak Staff Badge is also safe for medical conditions including pregnancy and breastfeeding, as well as for patients or staff members that have a pacemaker or stent. RTLS technology interferes with medical equipment: Radio frequency is wireless technology used to send signals and communications. In order to avoid interference, CenTrak is certified by the FCC and chose to use the 900 MHz ISM band for RF; the same band safely used for decades in medical system. CenTrak currently has over 2 million tags in use at hospitals and has never received any reports on RF interference with any piece of equipment. The 900 MHz ISM band is not utilized by any known cellular carriers and therefore does not interfere with hand-held electronics (mobile phones, tablets, etc.). Discuss change: No matter the size of your hospital, discussing your switch to RTLS with employees beforehand is important. It gives you an opportunity to introduce RTLS and address any concerns, as well as explain its potential benefit to the workplace. Educate employees: It’s essential to provide your staff with the tools to learn about RTLS. Offer brochures, seminars, emails and other materials before implementation to help employees understand the purpose of RTLS and how it’ll affect their usual routines. Schedule training: For the best results in RTLS staff buy-in, make sure you host training sessions. While the system is simple to use and straightforward, these meetings are a chance to demonstrate the benefits and features of RTLS, as well as disprove myths about it for both existing and newly-hired staff. Answer questions: With any technology integration, there are always questions. Make sure you’re available to respond to them as well as any concerns your staff has. Compile an FAQ list to post in staff areas, or send it out in a company-wide email. Host follow-ups: Check on your staff by following up with surveys. See where you can improve, whether by providing additional information or alleviating concerns among staff members. More than 900 hospitals and their staff members have adopted the CenTrak RTLS with success. Find out more about the productivity, safety and prevention CenTrak’s RTLS can bring to your healthcare network by contacting us today for a free demo.